As a kid, getting to Christmas day was a journey full of prayers, decorations, and food. Years later, I realize how much I love all those traditions. Having lived in the United States for almost seven years, I haven’t been able to truly enjoy a full on Colombian Holiday season in its full glory for a while. 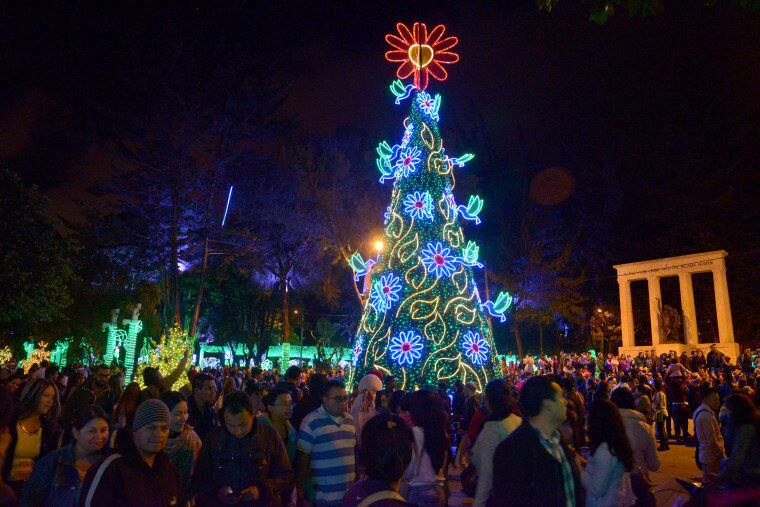 Colombians take the Christmas and New Year’s holidays very seriously. It’s a competition of survival. Since we don’t celebrate Thanksgiving, November is basically a month-long preparation where everybody begins Christmas shopping and begins the endless numbers of lists for decorations and food menus. December 1st, decorations go up EVERYWHERE. It’s like everybody stayed up the night before tirelessly decorating because they appear out of full air. I don’t think I have ever seen a single house or street in Bogotá not decorated for Christmas (and if you are that person who doesn’t, COME ON, get in the spirit). This is still not the beginning of the Christmas season, this is just the built up. The unofficial official start of the holiday season is December 7th, the Día de las Velitas, a national holiday in Colombia. On every corner, you can spot someone selling a set of candles which you would later see up on peoples’ porches, windowsills, and sidewalks; basically anywhere with a flat surface will hold the candles. I remember walking to school the next morning and seeing the streets full of candle wax leftover from the candles that were lit. This was when I knew we were getting close to the finish line but the real tests (yes, tests) begin December 16th: the first day of the Novena de Aguinaldos. If you grew up in Colombia or have Colombian parents who did the Novena with you every year, you’ll understand when I say that those verses of the Oración al Niño Jesús will forever be ingrained in my memory. Seriously. I am 21 years old and I haven’t needed to look at the lyrics when singing since I was 10. I also remember laughing uncontrollably during the Oración a San José saying “padre putativo” which could’ve just been my sister and I being silly over its similar sound to that curse word I would never dare to utter. In the past years I’ve seen versions that changed it to “padre adoptivo”, perhaps saving a few kids a sternful look from their mother (sorry, ma). We lived in an apartment complex in Ciudad Salitre, Bogotá, for most of my childhood and every year they would host a party for all the families and kids to do the novenas together. We’d all bring our maracas and other instruments to sing (rather off-key) some of the villancicos, my favorites being Tutaina and Campana Sobre Campana. These are the two songs that no matter what, I will sing as if my voice sounded like Shakira. To me, this used to be the only way I could get through this hour-long prayer without complaining. For starters, we’d get to see the other kids from the building and sing and laugh through the prayer together. Then, they would ALWAYS give us kids a tiny little gift or special treat that adults would not get (I curse the day I turned 8 and was too old to get those special treats). And finally, we’d stay way dancing, singing, and eating buñuelos until our parents told us it was bedtime. I really miss the novenas. When I was a kid, they used to feel like a task that I needed to check off in order to make it to the 24th. Now, it feels like a treat. It’s our tradition, nuestra tradición, that makes you deserve whatever el Niño brings you. Since there isn’t any build up here in the U.S. for Christmas, it’s really hard to make time in our already-busy days to just pray for an hour. And, living away from my family doesn’t make it any easier as it’s really hard to do a novena all by yourself. THIS I miss the most. If you had told 10-year-old me that I’d miss novenas, I would have rolled my eyes. Night nine, December 24th, is the last bit that seems to double in length compared to night one. Every Christmas night, we’d stuff ourselves with many different typical dishes such as lechona (yummy), buñuelos (never met a person who dislikes these) and natilla con uvas pasas (not so yummy for me, some love it). After the final novena, which we did close to midnight, we’d open our gifts right after the clock turned 12:00am and stay up playing, laughing and singing. The 25th is recovery time. You’d eat leftover food, clean all the wrapping paper and simply spend time with family. This year, it will be traveling time as my family and I travel back to Colombia to celebrate New Year’s, my first time going to Colombia for longer than three days in over almost four years. In my family, we have the unofficial bonus holiday of my mother’s birthday on the 26th because it was an excuse for us to eat even more, specially the tres leches from ‘Nicolukas’ we got to enjoy. We also get this cake to celebrate New Year’s and basically any occasion that requires dessert. Then, New Year's celebrations commence, the one's I am the most excited to experience again to close out 2015 while back home. We will celebrate the unofficial holiday of El Día de los Inocentes on December 28th, a day full of fun and jokes. TV channels will show some of their anchors making mistakes will the newspapers will post fake news. And on New Year's Eve, we will prepare ourselves to leave 2015 behind. We will be wearing yellow underwear with money and lentils in our pockets for good luck. Everyone will eat twelve grapes for twelve wishes when the clock strikes twelve. And a handful of people will be running around the block with a suitcase in their hands before the night commences a night full of booze and dancing. It's all crazy. It's all sometimes messy. But I love and dearly miss all of my crazy Colombianos and our unique traditions. And I can't wait to be home again. ¡Pa' el 2016 nos vamos!